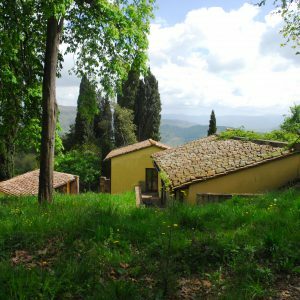 Villa Le Fonti is located in Monteloro, a beautiful village in the municipality of Pontassieve, in a pristine natural area rich of scents, colours, silence and peace. 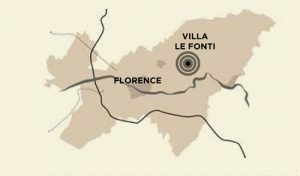 The Villa has a privileged location, it’s only 7 Km from Fiesole and 20 Km from the city of Florence, almost about 25 minutes from the Amerigo Vespucci airport in Peretola and 30 minutes from the central railway station of Santa Maria Novella. Drive passable routes are completely paved and well finished. 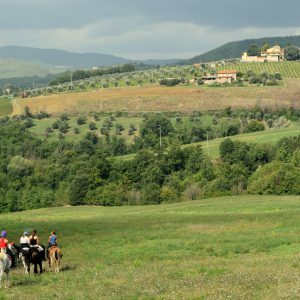 In every season, the surroundings of the estate, offer a wide variety of activities: horse riding; trekking; cycling; trips to the woods, vineyards and olive groves walking; hunting trips; truffles and mushrooms excursions and golf training. 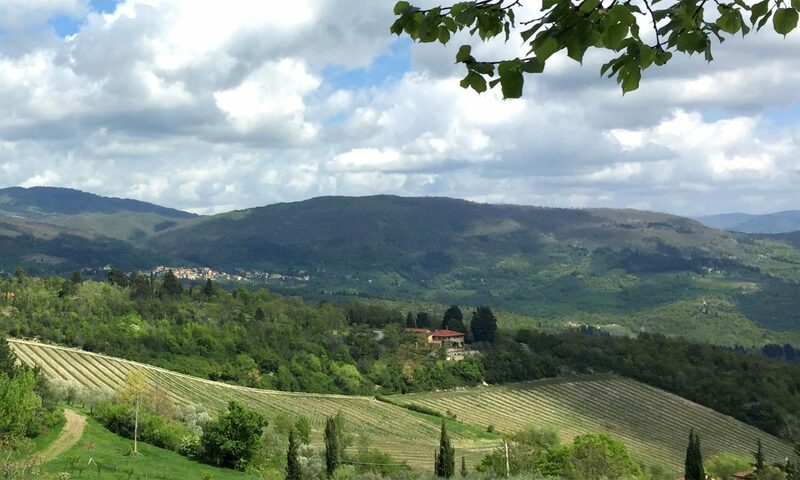 The neighbour crusher farms serve wine tastings, precious oils and delicious gourmet dishes from Tuscany, with the opportunity to attend cooking classes and wine tasting courses. During different time in the year, the towns in the area celebrate music festivals, gastronomic fairs and folk parades painting the squares with rich arts and crafts markets. The territory’s city par excellence is Florence, the splendid city of art that is recognized by UNESCO as a World Heritage Site for the wealth and beauty of its monuments. The city’s enchanting historic centre never ceases to arouse interest with its countless masterpieces: the architecture and colourful marble of the churches remind one of Florence’s splendorous past and the part it played in the development of Renaissance culture and art. The heart of the city and the religious and historical centre is the Piazza del Duomo, the site of a monumental complex of extreme value: the Duomo of Santa Maria del Fiore, rich in works of art and topped by Brunelleschi’s majestic dome. The Baptistery of San Giovanni (St. John’s Baptistry), a great example of Florentine Romanesque architecture, lies in front of the Duomo, facing Giotto’s Bell Tower, a chef d’oeuvre of Florentine Gothic architecture. The splendid Loggia del Bigallo completes the Piazza’s grandeur. Behind the Duomo is the magnificent Museo of “Opera di Santa Maria del Fiore”, exhibiting a precious collection of artwork that was originally inside the Cathedral, Baptistry and Bell Tower. The throbbing heart of the city branches off from Ponte Vecchio, which is the headquarters of ancient jewelers, to Piazza della Signoria, Palazzo Vecchio, Loggia dei Lanzi, up to the impressive Uffizi’s square that is surrounded by the majestic Uffizi palace designed by Vasari. At every street corner, the traveler can discover artistic treasures. Lying on the banks of the Arno, the city relished a special charm atmosphere, like a trick, that you never stop to enjoy at any time. In picturesque Florentine places the guest will feel at home. Surrounded by olive groves and the vineyards of Chianti, Siena is one of the most beautiful cities of Tuscany. Set on three hills, the city is drawn together by winding alleyways and steep steps, whilst the Piazza del Campo stands at its heart, and the Duomo and St. Maria della Scala serve as additional cultural landmarks. Famed for the “Palio”, the annual historic horse-races that take place on 2 July and 16 August, it is also home to one of the oldest Universities in Europe, which ensures a vibrant Italian student atmosphere throughout the academic year. In addition to the bustling daily life of the streets and squares of the city, Siena offers many cultural events, concerts, cinema, theatre and a wide range of sporting activities. Nearby stands the Convent of Osservanza which gives an impressive view over the city. A few kilometres from the city is the ancient outdoor bathing at Petriolo Spa Resort not to miss the opportunity to spend a day of relaxation. Few regions in the world offer to the visitor the “show” that surrounds Siena. 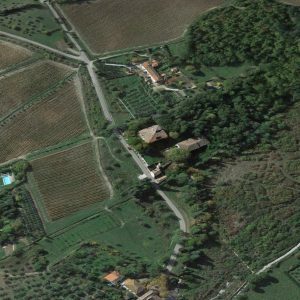 About 25 Km to the north, on a hill overlooking the Valdelsa valley, in the heart of a campaign of olive groves and vineyards, is based in the town of San Gimignano, an outstanding example of medieval town. Closed by this town stands the convent of San Vivaldo with 18 small chapels immersed in the woods. Continuing northwards one sees on a green hill, Monteriggioni enclosed its suggestive “circle” frozen in its time and space. The south of Siena, it’s characterised by the lands of the Brunello with the village of Montalcino, famous for its Brunello wine, where there is the Abbey of Sant’ Antimo, an extraordinary example of Roman architecture of the 12th century. The Crete of Siena, located at west side, offer an unique “lunar” landscape that ends to the Tyrrhenian coast. Piombino and Livorno are ancient and picturesque old cores, that connect the beautiful Tuscan archipelago whit all its islands: Elba, Giglio, Capraia, Gorgona, Giannutri, Pianosa and Montecristo. These islands are rich of parks and WWF’s reserves. Along the Tyrrhenian coast, Tuscany has well-organized cities to welcome tourists during all the year. Lucca is a Roman city surrounded by ancient walls. It’s a suggestive Medieval setting charecterized by historical palaces and towers of Antelminelli square and Via Guinigi. In this city the quality of life is very high and comfortable. In a few dozen Km. 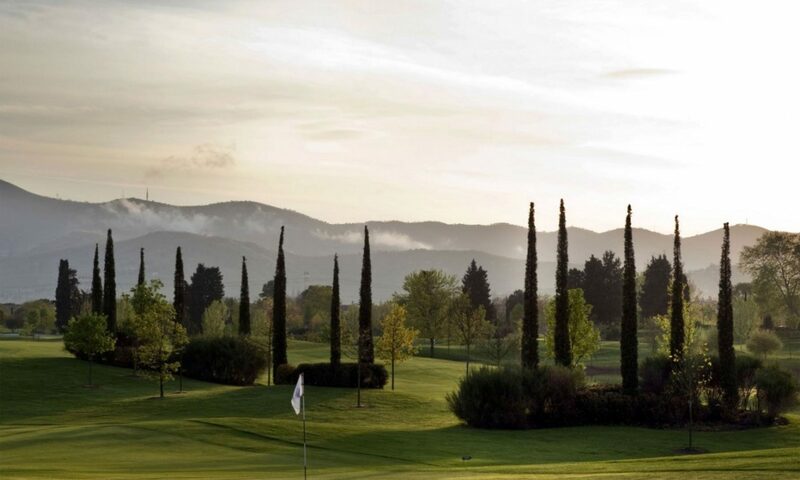 lies the costa Versiliana with the towns of Forte dei Marmi and Viareggio which are a perfect charming holiday destination. Viareggio is very famous for the Carnival parade on February and Forte dei Marmi shows luxury boutiques of all styles. 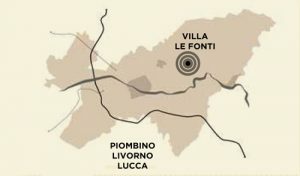 Behind the two towns the landscape is dominated by the Alps, which were so dear to Michelangelo Buonarroti. 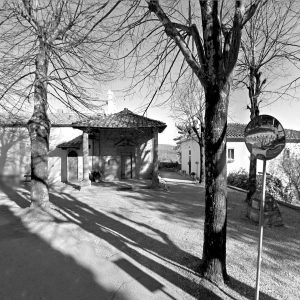 The orizont is completed by the wonderful Garfagnana with its ancient and picturesque villages. These lands donate unique panoramas.  Here, all the resorts are arranged to satisfy the most demanding tourist.